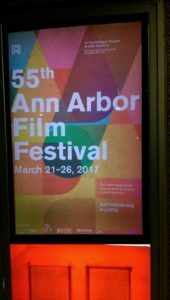 Films in Competition 5 was my very first taste of the Ann Arbor Film Fest, and it was exactly what I expected. Indeed, the very first short film–Everything Turns…–was a roller-coaster of a film that quite literally stayed true to its name. Shot on what looked like either 8 or 16mm film, Everything Turns… jolted the audience from one sequence to another without breaking stride. Nothing was static. Film manipulation caused colossal stone blocks to open and close, a wooden barn to rotate, and other structures to recede into the distance. Although the work was clearly from a talented individual, I couldn’t help but feel that it was a little too long. Commodity City, presented the audience with a look inside the bowels of China’s New South China Mall, the largest shopping mall in the entire world. The director of the piece was clearly a photographer, as every shot of the film was static and composed like a photograph. While they were certainly all beautiful, I wish she had done more with the piece. Without crafting the hours of footage together into a coherent story, Commodity City is a collection of unrelated clips that is aesthetically pleasing, but lacking narrative thrust. Railment was one of my favorites of the night. The filmmaker, hailing from Japan, animated a film taken from his commuting experience on Japanese railways. All tones were in blue and grey, and the protagonist stood lonely in the car, isolated despite being surrounded by thousands of other commuters. Beautifully crafted and haunting. Snatched dealt with two French (?) girls running from a number of institutions–an orphanage, an abusive lover, and an oppressive workplace. Fighting against all of these forces draws them closer together by the end of the film. Snatched reminded me a bit of Moonlight, but with girls. Etude 1a: Release(1) was the perfect example of an eccentric and eclectic AAFF film. Slow motion, zoomed in shots of cowboys rounding up cattle. Screeching soundtrack. Black and white footage. 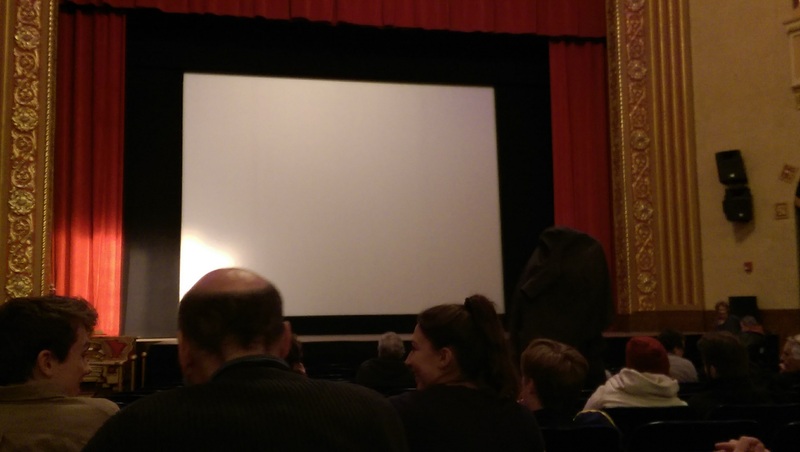 No idea what the film was about. Gardening at Night was the “biggest” film of the block in terms of production value and crew size. The film concerned a woman waiting for a phone call from the hospital regarding her friend’s battle with cancer. Autobiographical in nature, Gardening at Night also mixed in elements of horror. It reminded me a little of an M. Night Shyamalan film–one of his good films. My only wish is that the film had kept the lighting consistent throughout. I felt jarred a few times when the film went from a darkened living room at night to a bright swimming pool outside at noon. Crossing was too long. Regardless of it’s merits, 17 minutes is too long for a film that uses a repetitive soundtrack as the only source of sound to complement blurry sequences of people crossing the street. I enjoyed the concept, but the film was too long. There’s nothing more to say about that. Any given block of films at the Ann Arbor Film Fest will leave you with a different experience, but I would wager that the experience will be worth it. 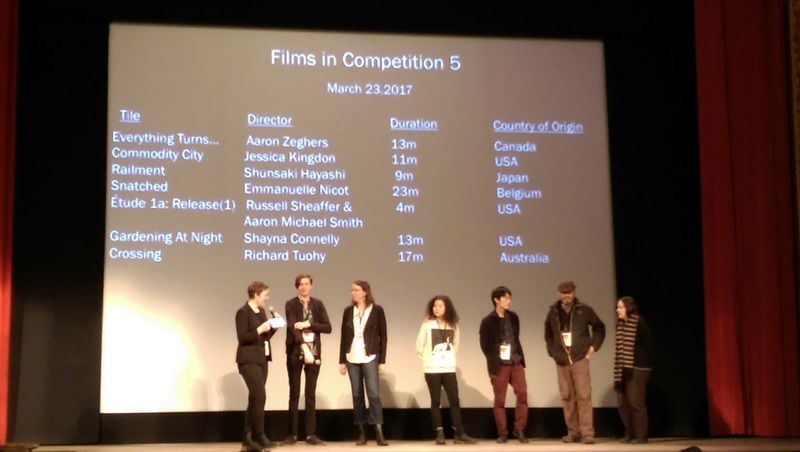 The nice thing about this fest is that the filmmakers get invited on the stage afterwards to answer questions from the audience. You don’t often get that opportunity.